Located in an exceptional and unmissable location in Courchevel Moriond, meet the sumptuous Manali Lodge. 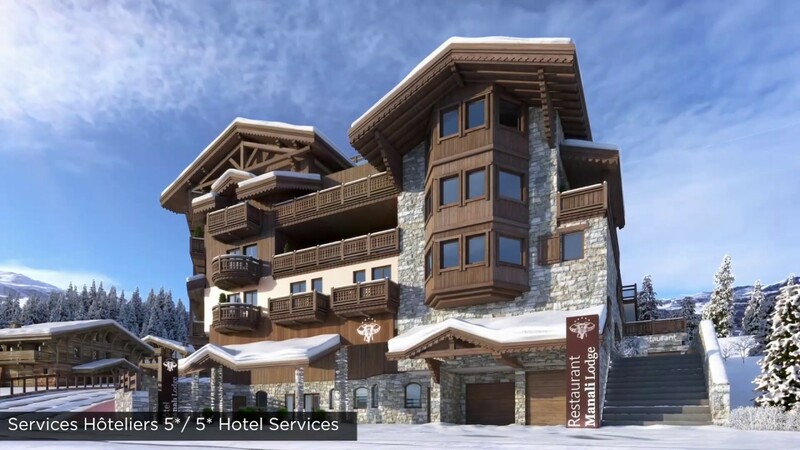 The ski-in ski-out and central location make this five star hotel residence the unmissable place to purchase a high end apartment in a ski resort. This existing establishment was first a renowned 5-star hotel known as the Manali. Built just 10 years ago, this legendary establishment is today replaced by an exceptional renovation project of 18 apartments named Manali Lodge. From 2 bedrooms + cabin to a large splendid penthouse with 5 bedrooms + cabin, these unique apartments all benefit from beautiful opened views and combine the charm of wooden architecture to the modernity comfort. Manali Lodge offers to the future owners the exclusivity to appreciate their apartment while enjoying the comfort of on-site five star hotel services. Manali Lodge offers to the future owners the exclusivity to appreciate their apartment while enjoying the comfort of on-site five-star hotel services. Hotel receptionist available 24/7 and wide choices of concierge services (cleaning, room service, taxi transfers…). The lounge bar restaurant and the main restaurant with terrace on the ski slopes will be opened to the public. Enjoy a relaxing moment in the private spa with a swimming pool, steam room, sauna, treatment rooms and gym. Each apartment includes at least one private parking space. Carpark is closed to public. For a perfect day on the ski slopes, buy or rent your good quality ski equipment from our professional team. Customised options for your property rental which easily combine rental income and personal use. Our selection of high quality interiors has been carefully chosen to help you create the perfect modern Alpine style, in harmony with the design of your property in mind. Our interior designers will assist you and help you create your ideal home among a wide range of personalised interior finishing choices ; from the door handles to the fireplace model and from the fully equipped kitchen to the interior woodwork. Our interior designer will also offer you a complete selection of furniture and decoration to finalise your futur exceptional home on the slopes in Courchevel Moriond (in option). We invite to see here bellow examples of our past design projects.